This week I ran the planning meeting of my professional learning group. The idea was to bring together a group of teachers (in this case the teachers of 5 year 9 maths sets) and collaborate on the planning and assessment of a topic. What are we doing here, and how are we doing it? Coordinator outlines key principles and aims. Personal introductions (if necessary). What prior knowledge will students have? What should students know/be able to do by the end? What are the main difficulties and misconceptions that students are likely to encounter in this topic? What connections would you expect a highly skilled student to make within this topic, and to other topics? Cross out less-important points until the material matches the teaching time available. 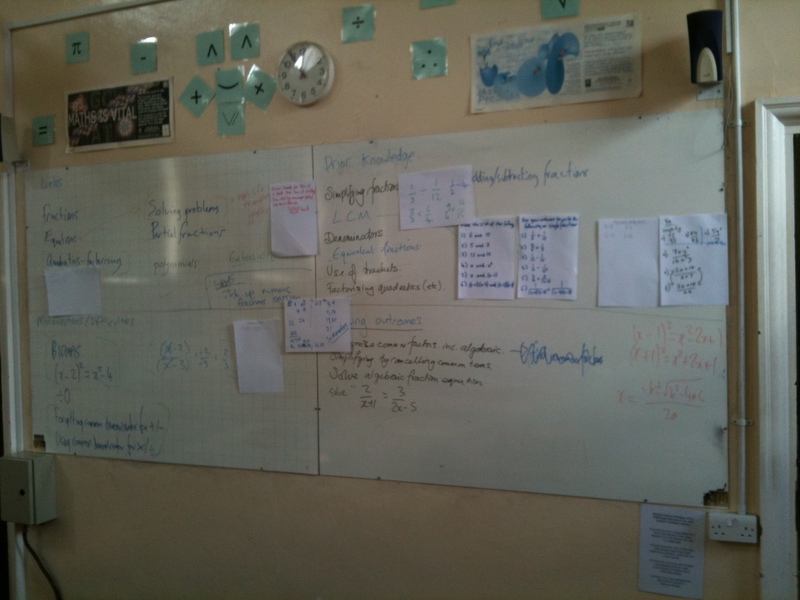 In pairs, come up with two or three questions or methods of assessment to match each remaining key point (10 mins), write on pieces of A4 and blu-tack them to the board. Share and discuss. How might we approach teaching, and what will we do do if students aren’t learning? Post-it notes on each question or point with strategy suggestions. Have we achieved what we wanted? How might this process be improved next time? It was a really interesting process. We stormed through planning the four key areas, and then started a good discussion about which ideas were to be explicitly taught, which would be implicit through work, and which would be left for another day. The tough part came when we started working out questions for the initial formative test and the final summative test. This resulted in some further discussion about what was necessary, as we decided that some of the questions were so important that we had to reinstate some of the learning obectives. We also thought about the key misconceptions with each question, and in doing so decided on extra questions for the initial formative test. As Maths teachers we’re quite wedded to tests, but we decided that the most beneficial way of comparing the learning of students when they began the topic would be to ask them to write out worked examples of 10 key questions. We will then take samples of this work and compare and contrast the approaches taken by different students, and see how this affected their progress in the unit, and also their performance in the summative test. We found that using a textbook was a great way to get questions for the final test, as making questions up off the top of our heads was taking too long. When it came to thinking about strategies for teaching we drew a bit of a blank, as we had already had some discussion about it before, and I think everyone was flagging by that point. This also affected the debrief – I actually completely forgot to demonstrate the VLE/Moodle page that we would be using collaboratively. People were also a little reluctant to give immediate feedback on “how useful the process had been” or “how to improve it next time”. I think that was mainly because it was so new they didn’t have much to compare it with, so hopefully after a little time to reflect there will be more ideas. Here’s a photo of the ‘art’ we created all over the whiteboards as we collaboratively planned our unit. A really good first meeting. I’ll report back on how the teaching and summary meetings go. Any thoughts on how to improve this next time?